Lets go to Burning Man 2016!? After the experience of six incredible Kiwiburns (late Jan each year) in New Zealand, I knew it was time to take the leap to the ‘big burn’ in the Nevada Desert; 'Burning Man Festival'. It is something I had been wanting to do for quite a few years and it had made itself to the top of my bucketlist. In 2012 I had a good crack at it, but I did not manage to get tickets during the crazy sell outs. I realise now that I was not really that committed back then and the timing to take on such an adventure was not right personally, professionally or financially. Not getting tickets right away meant I just 'gave up'. I realise now that if you commit you will get tickets easily despite the annual sellout dramas as a lot of tickets are in circulation leading up to the event. Lesson one: if you want to do it, then you need to 100% commit. The amazing view of Mount Cook during my annual review and goal setting adventure, Jan 2015. Of course after the epically inspiring experiences of Kiwiburn January 2015 I was still pumped up about Burning Man as a key goal for my year. Later on, a huge driver of this trip was to do the ‘Mirrorman World Tour’, which I later added onto the adventure to Burning Man. Lesson two: This is no small undertaking, it will need to be a key goal for your year if you want it to happen. So with the goal in mind, I took a scary and irreversible action to start making it a reality – I booked return flights to the US after finding a great deal on adioso.com. Sure I didn’t have tickets to the actual event yet, and yes they sell out within a few minutes each year – but that didn’t matter as I knew I would get them somehow; now that I had committed! Lesson three: 100% committing means doing something irreversible and scary. Now I am a FIRM believer that the more sweat, blood and tears you put into something, the more you get out of it. Going to Burning Man is FULL of sweat, blood, tears (and dust) at EVERY level imaginable. If you think it is going to be all fun, friendships and fire then you will be in for a ride to hell and back. The pre event planning and prep is all part of this too. Going to Burning Man from New Zealand is even harder due to the significant financial costs and the challenges of having everything you need to survive 10 days in the extremely harsh hot, cold, dry and dusty desert. One of the ten principles of Burning Man is ‘radical self reliance’ – I did not really understand this fully until I went to Burning Man itself – Kiwiburn in comparison is a ‘walk in the... well… paddock’. Lesson four: The more you put into it, the more you will get out. I was lucky to have a saviour whom would help make my journey possible – and incredible – Mr Paulo Wellman, the co-creator of the Highly Flammable 'Mirrorman'. I had met Denver based Paulo, way back in 2011 when he was travelling around New Zealand and had volunteered with some of my friends to build the Kiwiburn Temple that year. 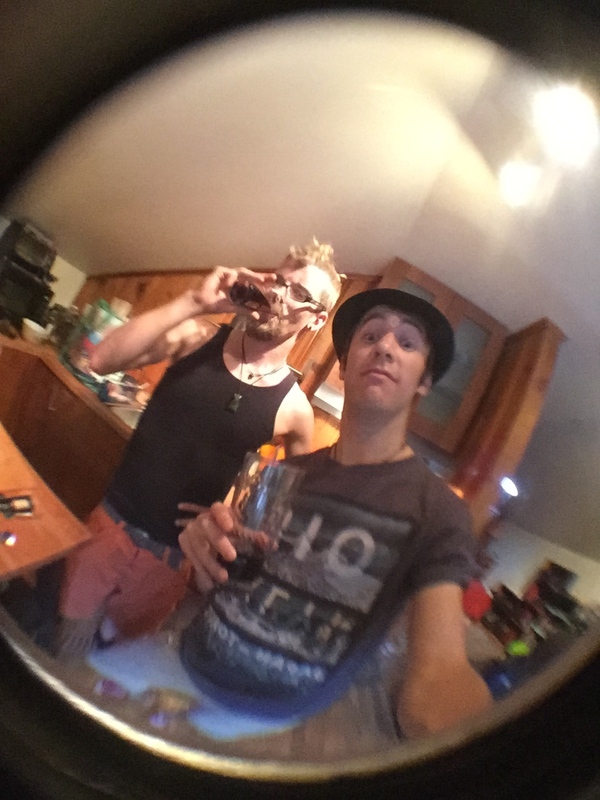 Paulo sums up the fun times we had at Kiwiburn that year with an intro he made to our Burning Man camp friends: "I once spent 30 minutes dowsing Logan with freezing water at 4am by his request - a great experience". I had been a Stilt Walking Faun for several hours and was overheating… just another day at the office really! Mr Paulo Wellman and I onsite at Burning Man. Paulo had always said he would love to host me at Burning Man and we stayed in touch over the years. Finally it was time and the hospitality he and his amazing group of friends provided was inspiring. I feel he went above and beyond what I thought was even possible. So I flew into Denver and helped with pre event preparation for a week. Lesson five: Find someone based in the US who can help you. Paulo and his friends (now my friends too!) certainly know how to do Burning Man and the preparation was a huge part of this. Once your out there in the desert, you want EVERYTHING to be as easy as possible. At Burning Man another principle is ‘de-commodification’ meaning you cannot purchase anything onsite (except coffee and ice) - so you have to bring everything in (and take EVERYTHING out – another principle: leave no trace). For our camp this meant building, assembling and testing everything in Paulo's backyard to practice putting it up and check we had everything required (and fixing my tent!). Pre event prep at Paulo's workshop in Denver. We headed out in a massive loaded van across four states with two of Paulo's friends; Chad and Josh, to get to Black Rock City where Burning Man is based. 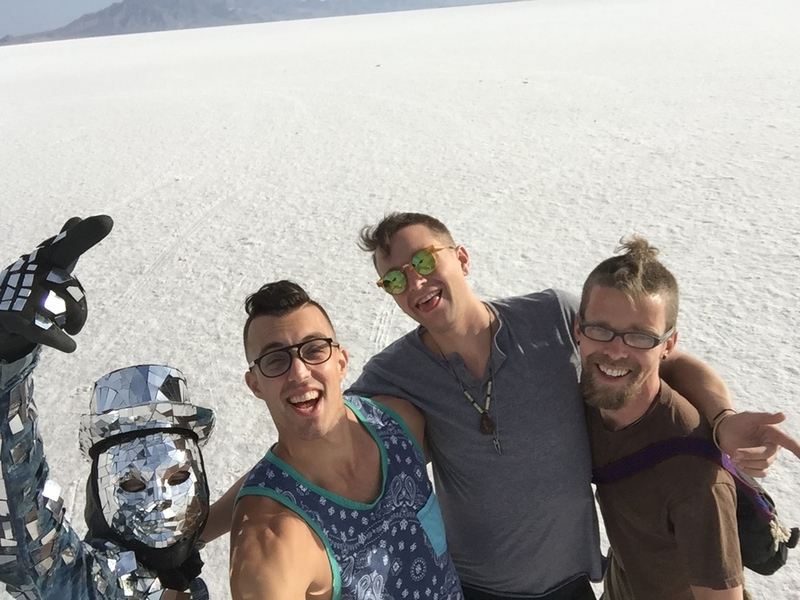 The trip was an awesome way to transition from reality to the madness of Burning Man. On route we even managed to do a photoshoot at sunrise with Mirrorman on the Utah Salt Flats of Bonneville Speedway where the 'Worlds Fastest Indian' movie is based! Mirrorman at the Utah Salt Flats - 'Worlds Fastest Mirrorman'. Arriving in Black Rock City was like trying to enter the gates of hell after an apocalypse (inappropriate reference…. maybe!). We arrived in a nearby town 50 Miles out at 5pm Sunday night after 2 days of driving – we thought we would be able to setup camp before sundown. The queue started around corner as it seemed 70,000 eager participants had arrived at once. We drove into Black Rock city at 6am… Paulo did an INCREDIBLE job driving stop start all night – it was all pretty bizarre really. We saw the sunset, moonrise and then sunrise. We had a dance party in the queue. We slept on the road. We showed off our party costumes (Mirrorman even got out for a boogie). We met some really cool people. More importantly we mentally prepared for the 10 days ahead and relaxed our expectations. I had intended this article to cover the whole experience - but the more I wrote, the more I realised there is to write about this life changing experience! Stay tuned for the next post about the event and experiences itself: 'Why Burning Man never leaves your bucketlist'. For now here are some more images of the pre-event adventures! 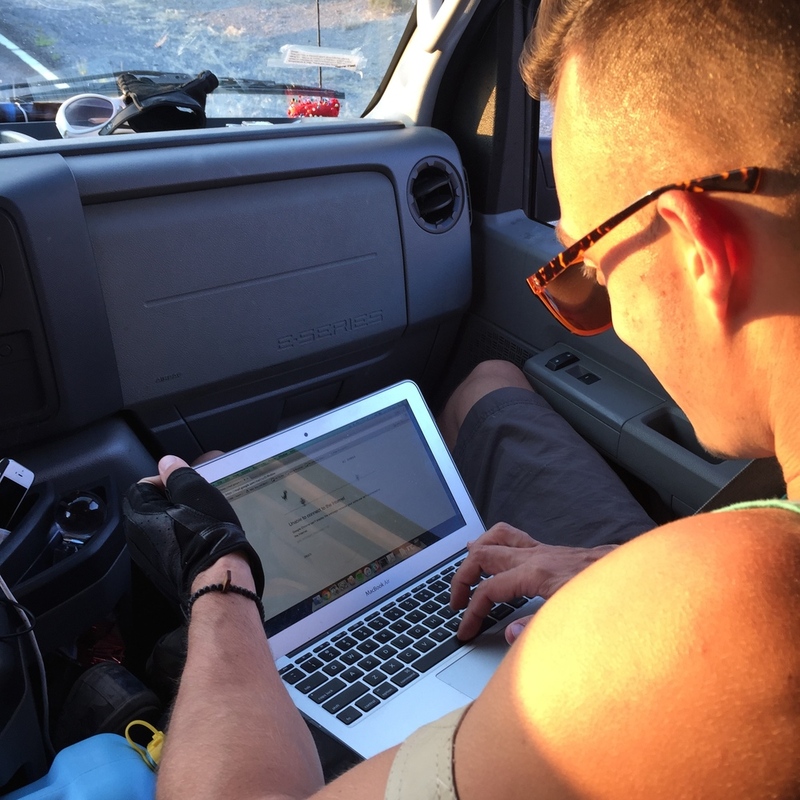 Newer PostSo what is a digital nomad anyway?